Haz 5 presentaciones en inglés en 5 semanas – un programa muy práctico de coaching en presentaciones en inglés y cómo sentirte bien a la hora de hacer presentaciones en inglés. 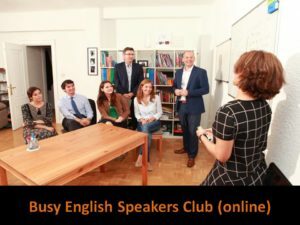 Un club conversacional de inglés online para personas y profesionales ocupados. An English speaking club for busy people. 1) Practice speaking in English. 2) 10 speaking tasks of 1 to 3 minutes. 3) Give and receive feedback from the group. 4) Want more help and support? Get in touch with us at The English Training Company (www.englishtco.com) Get speaking English!